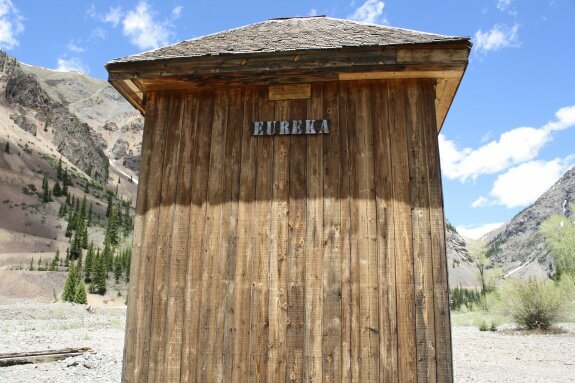 One of the towns along the Alpine Loop, Eureka had a post office by 1875. In 1896, the railroad arrived on what is currently the Alpine Loop road grade. The Sunnyside mill was the town's main industry, and with its closing, the town died. 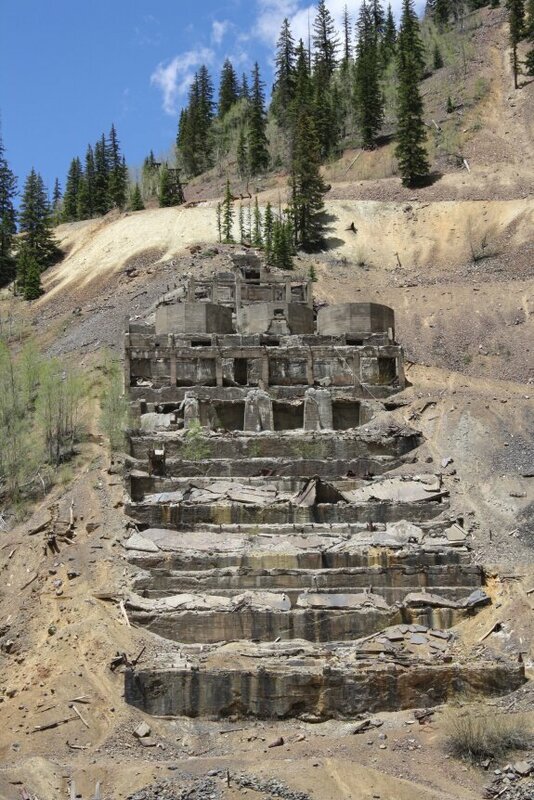 The original mill was replaced with a larger one using the material from the Gold Prince Mill at Animas Forks. 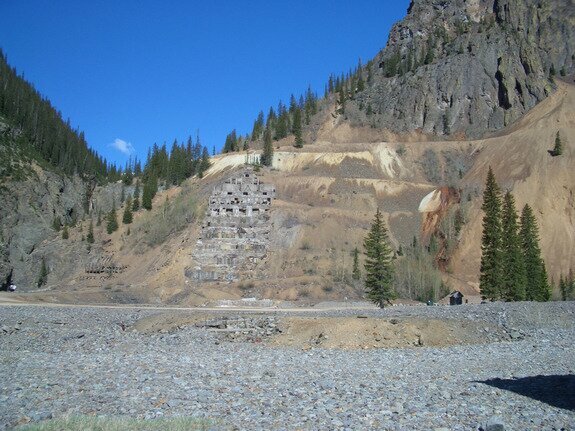 (See its foundations in Animas Forks.) Today, only the foundations of the mill and its jail remain. Many "dugout" pits remain where buildings once were. And although it is entirely possible to drive the rocky roads through the town, you�re asking for a 100 year old rusty nail in your tire. 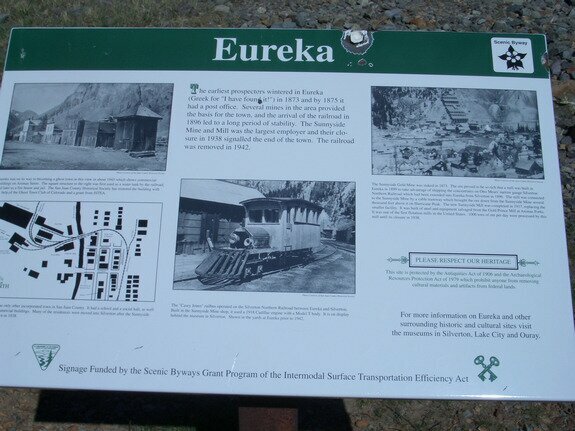 (From experience...) Eureka's hidden treasures will not remain for long. The last time I saw it, it had 20 people camping on its old main streets. 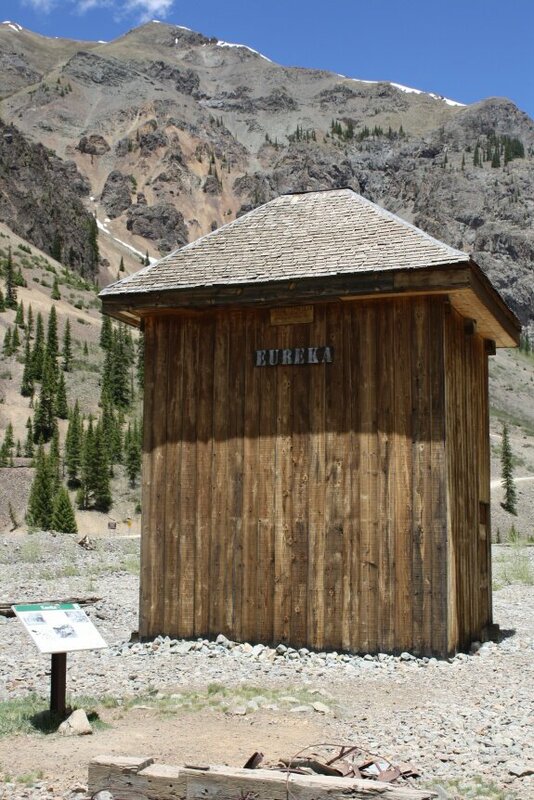 Displaying Eureka photography page 1 out of 2. Date Taken: 2005:05:30 22:38:59 Want to use this image? See the More information tab. The remains (foundations) of the Mill. Note above the road is the road up Eureka Gulch. Lake Emma (drained by large accident in 1973) is on this road. Date Taken: 2005:05:30 22:39:05 Want to use this image? See the More information tab. The restored (possibly rebuilt) jail of Eureka, the only remaining and standing structure. Date Taken: 2005:05:30 22:39:09 Want to use this image? See the More information tab. Date Taken: 2010:06:05 13:03:33 Want to use this image? See the More information tab. Date Taken: 2010:06:05 13:04:31 Want to use this image? See the More information tab. Date Taken: 2010:06:05 13:06:35 Want to use this image? See the More information tab. Date Taken: 2016:06:01 10:26:22 Want to use this image? See the More information tab. Date Taken: 2016:06:01 10:27:44 Want to use this image? See the More information tab. Date Taken: 2016:06:01 10:29:43 Want to use this image? See the More information tab. Date Taken: 2016:06:01 10:30:24 Want to use this image? See the More information tab.